BACKTOFRANKBLACK.COM: Frank Spotnitz speaks! Millennium Group Sessions FREE podcast! Frank Spotnitz speaks! Millennium Group Sessions FREE podcast! 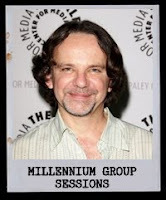 In this special episode in the Millennium Group Sessions series, Troy and Jim speak to Big Light Productions main honcho, producer and writer of Millennium and the X-Files, Mr Frank Spotnitz. In this special and free podcast, Frank speaks of his role as a writer, his love of Millennium and his work on the X-Files: IWTB - as well as the future in both franchises. NEXT WEEK: LANCE HENRIKSEN SPEAKS TO JIM AND TROY ON THE MILLENNIUM GROUP SESSIONS! 22 Responses to "Frank Spotnitz speaks! Millennium Group Sessions FREE podcast!" It was very informative and concise, not much clutter. Nicely done! Toodle loo or toodle pip! We'll make Brits of you all yet! Hey forgot to mention in the last post, James that is a great idea you had about the Millennium TV movie as a prequel to the next XF movie in 2012. I am all for that one! Really enjoyed this one. Incredible is the only way to describe these podcasts. Guys, thank you so much for this interview! It's always a pleasure to listen to Frank, but your great questions and comments make it even more enjoyable! And what a cool idea about Millennium prequel!!! Another great interview, guys! It's always interesting to hear about the writing aspect. Can't wait until the lance interview! Keep up the great work! It's much appreciated! Thank you so much in believing in Millennium Frank! Pleeease speak to Chris! We want more! It was an absolute thrill to talk with Frank on the podcast. We appreciated his openiness on the episode. Some great Millennium and X-Files discussion. A little bit of something for everyone. Thanks again Frank for taking the time out of your busy schedule to talk with us! Apologies for not leaving comments on the blog sooner. I could see the comments but never saw where to submit comments, so I've been sending feedback via email and posting tweets on the Back to Frank Black Twitter page. One of my favourite podcast interviews so far, Frank Spotnitz's, along with Klea Scott, Jon Polito and Lance's. I can think of one website where I think they would be interested in the Back to Frank Black campaign. I was glad Robbery Homicide Division was mentioned in the interview. I've visited Big Light Productions' website a few times but have never commented on their blog. Yet again another great show fellas - it always amazes me the quality of the guest you get on your shows. We appreciate your hard work. Getting Frank on the show was fantastic and to hear how enthused he is about Millennium is really encouraging. Frank Black will return - believe it. Wow! It was wonderful listening to Frank! I hope the network sees the value in this project, and the value Frank and Chris bring to entertainment. They know how to weave tales with such intelligence and artistry. I'm on board for all 1013 gigs. Keep them coming please! What an amazing AMAZING interview! Gosh, I never know what to say exactly because all I want to do is burst with excitement!!! Listening to these podcasts is just so surreal. And a blessing! Because I need this, I want to believe that we can get Millennium back. I met you once and will always remember how incredibly sweet you were, how big your heart is to communicate with the fan of your vision. Your heart came through this interview, bringing me back and AH! I just wish you the best Mr. Spotnitz. I shall stop gushing all over this blog. Hahaha. Mr. Spotnitz, you are an amazing and brilliant man. Thank you thank you thank you for taking the time to speak with James and Troy. And thank you two for being just as awesome, to make all of this happen. As a big X-Files and Millennium fan and an admirer of Frank Spotnitz's work I thoroughly enjoyed this amazing interview. Love hearing all the behind the scenes stuff and the writers' opinions on the work. Thank you Frank for this interview, I'm constantly amazed by your wonderful relationship with the fans of your work. enjoyable. Much thanx to Troy and James for thier efforts. It's great to know people from the series support the campaign, and are fans with us. i hope that high level guests like Frank bring us the kind of attention we need to succeed. thankx also to Frank for his part in making the show so cool. I had to listen twice cause well he got really deep into the discussion, and I totally agree with his comments on IWTB. Being the XF fan that I am, its really a shame that they weren't recognized for the risk they took. Wonderful interview! Definitely one of my favourite podcast interviews so far together with Klea Scott, Lance Henriksen's and Mark Snow's! Thank God you can download these and listen to them again, there is so much to take in, remember and savour. Fantastic work guys and thank you Frank Spotnitz for taking part. Your talent, dedication and hard work is so highly appreciated, but mostly thank you for being such a nice chap!